We kicked started Beauty Week with the basic gel manicure workshop conducted by The PinkRoom International at 2pm! It was a very small class of 5 but because of it, all of us managed to really get 1-on-1 experience with our instructor and the overall atmosphere was that of fun and laughter. The course officially began and our instructor, Jolene, taught us the difference between gel nail polishes and normal nail polishes. Did you know that gel polishes do not dry out when exposed to air? That is why bottles of gel polishes can last for decades! Gelish is just the brand of gel nail polishes so there's no difference between Gelish and all other gel nails with exception to types of pigments and whether it's a 1-step or 3-step process. Gel polishes are also naturally more viscous compared to normal nail varnish and for this particular brand, the pigments used are organic and it's only a 1-step gel polish. In other words, no need for base or primer! Moreover, gel polishes do not stain the nails as the pigments do not get absorbed by the nails after curing under a UV or LED lamp. Now, onto proper nail care. A lot of us think that gel polishes are bad for the nails but according to both Jolene and Master Educator, Joe Chua, it is actually the knowledge of your nailist and technique. So...let's get a bit educated. First: Nails are like hair. They're not 'alive'. There's no real need to let them 'breathe' as such but of course, healthy nails are also an indication of personal health. Which is why The PinkRoom kept emphasising on how to care for your nails by first removing the cuticle with a pumice stone if you're not confident to use the metal ones. It's gentle and it is exactly like how you'd remove dead skin from your feet. This also helps to set the nail clean for the gel polish to adhere properly onto your nail bed. They do not recommend using nail files to buff the nails, which is what most manicurists would do to prime your nails for the gel polish. Instead, use a gentle buffer and this would not thin down your nails. In fact, as emphasised by Joe, a proper manicurist would be buffing away the base coat from your previous gel manicure during this process. If your nails did not have a previous gel manicure, all the more the manicurist should be using a gentle buffer rather than a file. Soon, we were taught how to apply the layers of gel polish and to cure them in the lamp. LED lamps cure a lot faster than UV lamps and a lot of people prefer LED lamps over UV lamps thanks to all the articles written about UV exposure. For today's workshop, we were taught how to draw a penguin! We could choose our preferred base colour of our penguin before we went back to our seats to DIY. Check it out! All of our different penguins! There's an extra pig because I had more time and wanted another animal. LOL. After we were all done with our penguins, Master Educator, Joe Chua, came in to do an acrylic nail demo. Acrylic nails are considered to be one of the most difficult to do and the nailist's technique can be easily seen from the end product due to the thickness and shaping. Moreover, Joe decided to do a French Tip, which is a classic but also very difficult as the 'smile' of the nail has to be perfect. To show his skill, Master Joe did not use a fake stick-on but a form fitting acrylic. Acrylic nails last very long but they're the least popular among all the various types of nails because it requires a highly skilled nailist to be able to do perfect ones. Thus, the regular manicurist out there will not be able to shape the acrylic nails such that they look natural and may crack easily too. The finished acrylic nail! Doesn't it look natural? It's the fastest manicure that I've ever gotten too! 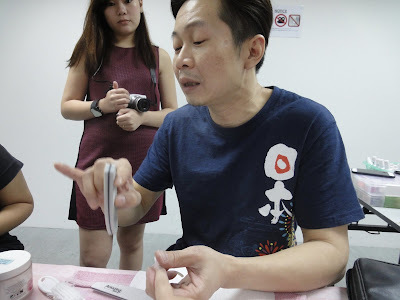 Master Joe also mentioned that another reason why acrylic nails aren't popular is because other manicurists tend to overfile the nail before soaking it in acetone to remove. Once again, it is important to find a manicurist who has been trained properly. 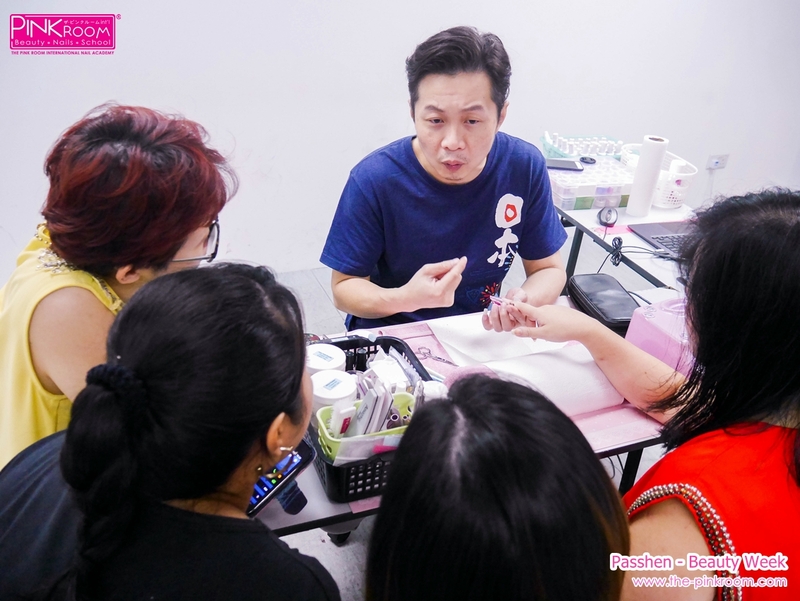 This is why The PinkRoom prides itself in being one of the few nail schools in Singapore to be able to give their students a proper diploma once they have finished their nail courses! 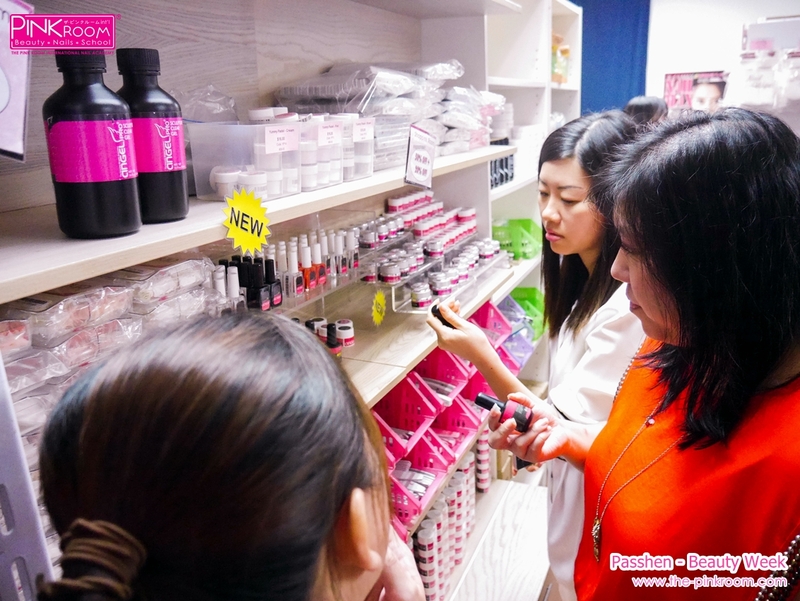 After the workshop, it was time to shop as The PinkRoom is now having a Clearance Sale!